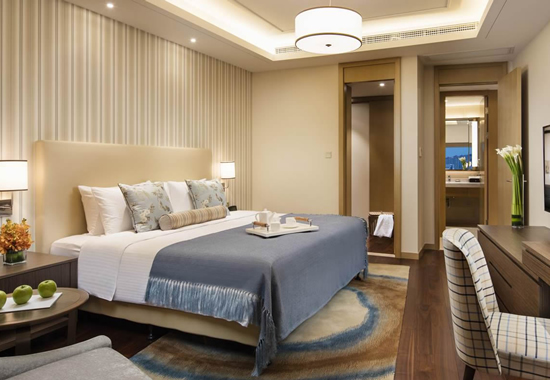 Offering vast views of the sea, Ascott Marina Xiamen is strategically situated within Siming District - the economic, cultural and political hub of the city. The residence is housed within Jiali Plaza, a mixed development project that also includes a shopping mall and SOHO apartments, offering guests a wide range of conveniences right at their doorstep. It is closely connected to the rest of the city via the Bus Rapid Transit and walking distance to the ferry terminal. A 10-minute walk will bring you to Xiamen’s main commercial street, Zhongshan Road Pedestrian Street. Stop over here on your way to Gulangyu Island, a picturesque destination about 600 metres off the coast of Xiamen city. Also in your vicinity is Yundang Lake, one of Xiamen’s main tourist attractions. Guests can choose from a wide range of accommodation variants, from stylish studios to spacious 3-bedroom apartments. The residence also offers a host of lifestyle facilities such as a swimming pool, gymnasium, yoga room, business centre, a breakfast lounge, and a residents' lounge.